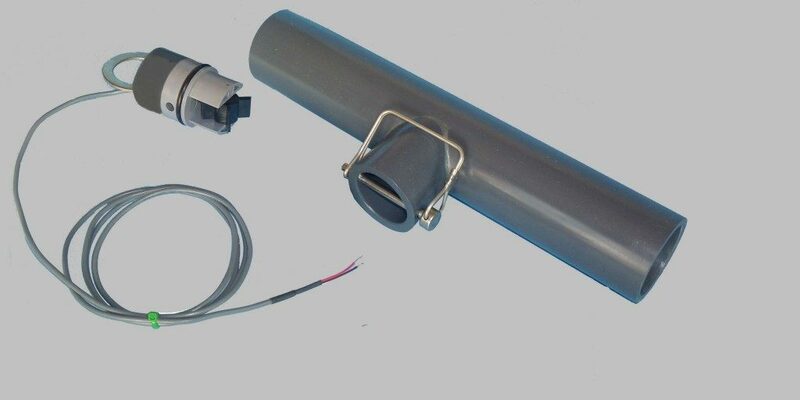 Pulse output flow sensor, when used in conjunction with the appropriate adapter, can monitor flows in pipes ranging in size from ½” to 8”. Paddle wheel flow meters are universally accepted as a means of measuring flow electronically. Wide range in flow rates, negligible head-loss and good accuracy at a reasonable price continue to make these meters popular. Easy removal for cleaning and repair permit the sensor to be mounted in lines with moderate particulate levels. The paddle wheel, spinning at a rate linearly proportional to the velocity of the flow, activates a switch once per revolution. The time it takes the paddle to rotate, divided into the diameter of the pipe, results in the flow rate. This meter consists of a switch that opens and closes once per revolution of the paddle wheel. A computer system capable of counting and timing must be used with this sensor. The pulse output paddle wheel sensor and associated parts are injection molded from PVC plastic, the paddle pin is stainless steel. The Buna-N O-ring can be replaced with Viton as an option. Consider these attractively priced, easily installed pulse output sensors. Please call for specific application questions.